In life, we’re always taking steps to protect our assets and property. Protection is often a necessity for survival as you buy insurance to guard your health and life insurance to protect your family in the event that you pass. In much the same way, we install alarms on our homes, acquire car insurance, home insurance, renters insurance or one of a dozen other types of coverage. So, why don’t people protect their investments in the same manner? Learn how to protect your investments. Your investment portfolio is often just as valuable as your other assets if not more so. Whether you hold stocks, mutual funds, ETFs or bonds, you can shield your investment portfolio from decline. As I’ve said before, the majority of my posts come from real life scenarios in which investors make major mistakes and I want to prevent you from doing the same. Yesterday, I watched as an investor lost 110% of his account value. Yes, you read that right. Not only did he lose his entire investment, but he is now in the negative, actually owing money. What did he do wrong? I’ll describe how he (let’s call him Bob) could have prevented such a disastrous loss and how you can do the same. Bob was borrowing on margin and heavily concentrated, meaning that all of his money was invested in one volatile pharmaceutical stock. Over the weekend, the company announced that phase 3 of their drug’s clinical trial was a complete failure. The stock price declined 60% on this news and took Bob’s equity with it. How could Bob have protected himself? As I’ve discussed before, options provide the perfect opportunity to protect individual stock positions. If you own stock like Bob did, you can purchase put options. Puts give you the right to sell the stock you own at a fixed price. If the stock declines below this price, you’re protected so you do not continue to lose money. Sticking with the same example, say the stock is trading at $15 per share. Bob knows the position is very volatile and he’d like to protect himself in the event that the stock tumbles. Bob could purchase put options with a $12 strike price. This means that Bob can sell his shares for $12 even if the price drops to $0. If the stock does not drop, but appreciates instead, Bob still owns the stock and the put options lose their value. Protecting one stock is easy with options, but can you guard your entire portfolio this way? Of course you can, but I wouldn’t. Purchasing several options will end up costing a lot in terms of commissions and premiums and this cost is going to offset any gains you hope to make. Instead, you can buy options on one single security that shares your portfolio objectives. For example, if you hold mostly large cap stocks that are part of the Dow Jones Industrial Average, buy puts on the Dow. If your portfolio is primarily invested in financial companies, buy puts on a financial index or exchange traded fund such as XLF. This way, you can hedge your entire portfolio by buying puts on just one or two underlying securities. When looking at options, you will see several different expiration dates. For the purpose of hedging, give yourself some time value. Personally, I buy options at least six months out. Not only do you save money on commissions, but you’ll see that the cumulative premiums are less when acquired this way. Some people are intimidated by options and would rather not have that type of security in their portfolio. Don’t worry, you can still protect yourself. As I said above, each industry or sector will have exchange traded funds that track them and move in a similar fashion. In addition to positively correlated ETFs, there are ETFs that move in the opposite direction of their benchmark. The securities are inversely related, meaning that they move down when the index increases and up when the index declines. Most mutual fund companies discourage any type of ‘trading’ and charge short-term redemption fees if you don’t hold the shares long enough. For that reason, I don’t recommend mutual funds as a hedging strategy unless the trade is in your 401(k). Most qualified plans such as 401(k)s have limited selections, so choosing a mutual fund such as a fixed income fund to hedge against an equity fund, is perfectly acceptable. Buying options and ETFs to hedge are the most common strategies, but there are other, less common alternatives. Some structured products also move in the opposite direction of the major indices. One of my favorite instruments to measure market volatility is the VIX, or volatility index. The mathematics behind the VIX gets pretty complicated, but in short, the VIX measures market volatility and the way it’s constructed produces a great hedge. 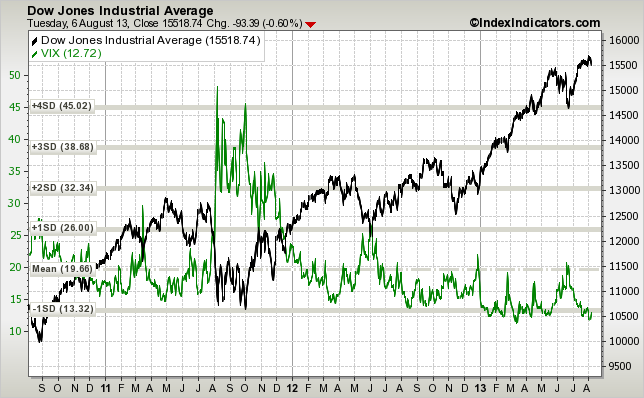 The chart below compares the VIX (green) to the Dow Jones Industrial Average (black) over a three year period. As you can see, they move in opposite directions almost perfectly. The VIX is more sensitive, but that can also be a benefit when holding VIX options. Holding commodities or commodity based ETFs is a another indirect hedging method. Explaining commodities is beyond the scope of this post, so I’ll refer to the most common commodity tracking ETFs: GLD, USO, UDN and UUP. GLD is a gold based ETF and USO tracks oil. You’ll find that much of the time, these two ETFs move in the opposite direction of the major indices. UDN and UUP are inverses of one another, but they both mimic a relationship to the US dollar. All of the strategies I’ve listed are ways to insure your portfolio against investment losses. Keep in mind that nobody can predict the future and there could be a time when some of these hedges fail and may need to be adjusted. Management of your portfolio should be an active process where you constantly evaluate for any weaknesses. Also, the risks mentioned only refer to investment losses, not the failure of financial institutions – for that, you always have SIPC and FDIC insurance. READERS: Can you share any other strategies to lower the risk of your portfolios? 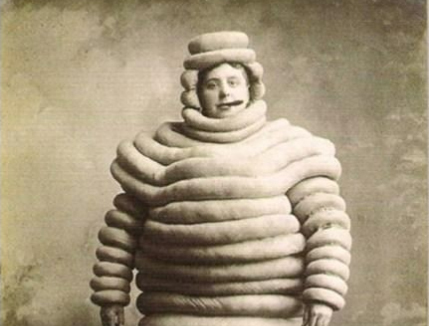 Has anyone incurred a large loss because of the lack of protection? I limit my position in one company to 5% at the most and I think that’s already too much. I diversify by buying other companies and holding index funds/ETF. That’s probably the easiest way to do it. Diversification is another great way to lower your portfolio risk. I’ve started on another post that describes correlation, beta and the modern portfolio theory. I’m trying to simplify it though, as it gets very complex. Because you hold several different securities Joe, have you used any risk assessment tools such as MPT? I will be the first to tell you that I have most of my investments in mutual funds because I don’t have time to closely monitor and trade individual stocks. I am also diversifying though by adding other forms of income and hope to add real estate income soon. Mutual funds are a good choice of you plan to simply buy and hold. I would just make sure you funds are diversified. People are getting pretty create and coming up with good alternatives to mutual funds. ETFs are one example. You can invest in the same assets as mutual funds, but save some money on the management fees. Another alternative that most people haven’t heard about yet is a product offered by Motifinvesting.com. They allow you to create your own investment package for an incredibly low price with NO management fees. I think we’re going to start seeing a lot of products like this. I use my asset allocation as a method to protect my assets. I own stocks, ETFs and mutual funds. My choice of stocks and funds help diversify my holding into safer sectors.